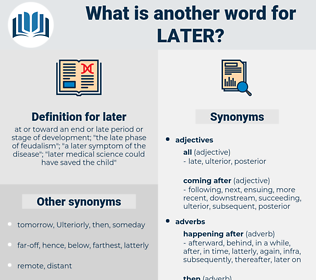 What is another word for later? 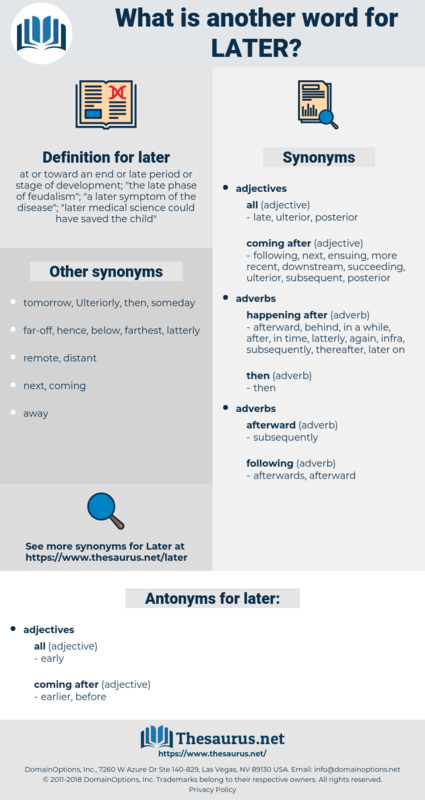 at or toward an end or late period or stage of development; " the late phase of feudalism"; " a later symptom of the disease"; " later medical science could have saved the child"
recent, last, eventual, forthcoming, consequent, successive, ulterior, other, secondly, forward, post-session, delayed, afternoon, belated, final, consequential, following, henceforth, deferral. afterward, eventually, latterly, shortly, soon, recently, lately, last, hereafter, before, sometime, consequently, quickly, ultimately, successively, below, previously, During, away, immediately, again, finally, hereinafter, longer, iater, now, furthermore, still, night, anymore, secondly, forward, ago, rapidly, ahead, lastly, accordingly, around, timeframe, apart, adult, Posteriorly, swiftly, henceforth. latter, thereafter, late, follow-on, ultimate. thereafter, after, subsequently, late, retrospectively. Would he come later if she should take a turn for the worse? Perhaps, later on, but not now. latria, lathery, letter r, letter h, la tour, lothario, litre, leather, litter, lather, letter o, looter, laudatory, littre, literary, litterer, loiterer, low water, letter e, lottery, letter w, liter, luther, leader, lidar, letter i, laudator, letter y, Lithia Water, lead tree, lead ore, letter, letterer, lauder, latter, loiter, leathery, lutra, luthier, letter a, ladder, loather, letter u, loader.